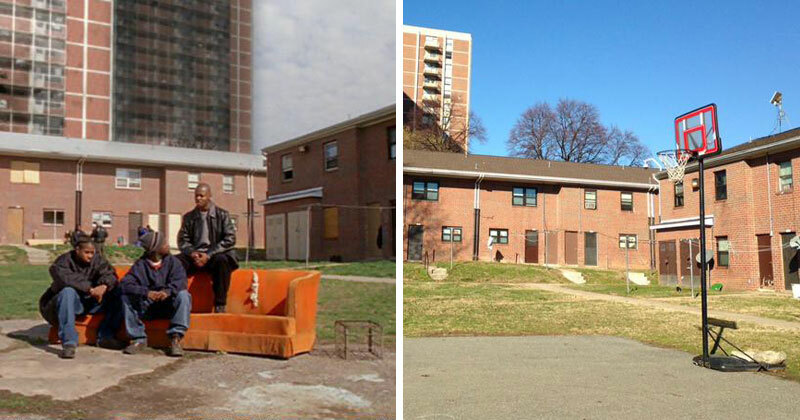 In honor of HBO’s re-release of The Wire—completely remastered in 16×9 full-frame HD—Baltimore Sun crime reporter Justin Fenton has been taking requests from people on Twitter and taking photos of present-day locations from the critically acclaimed television show. All 60 episodes are currently being marathoned on HBO Signature and HBO Go (one season per day, starting on Dec. 26 and ending on Dec. 30). The Wire: The Complete Series will also be released on Digital HD on January 5, 2015, and on Blu-ray in Summer 2015. Show creator David Simon has some very interesting opinions about the newly remastered HD version and shares his thoughts on an extensive blog post on his website about the differences in framing etc. by switching from 4:3 to 16:9. Now let Justin Fenton take you on a trip down memory lane with this ongoing series of scenes from The Wire, then and now.